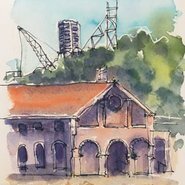 In this workshop, seasoned traveller and artist Sheila Posner will introduce you to the concept of the travel sketchbook as a fun and spontaneous way of recording images and experiences. Starting with a theme of interiors, you will experiment with water-based pens and watercolour, using line, wash and words to enhance your drawings. Sheila will show examples of her sketchbooks then demonstrate the use of materials before you embark on your own sketchbook pages. Bring a watercolour sketchbook (A5 or smaller is ideal). All other materials and references provided.